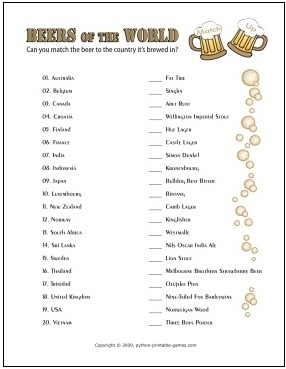 Printable Beer Trivia Games are the fun beer game you have been looking for. These ice breaker games help everyone get into the fun party mood. Beer trivia is perfect for a beer tasting or an Octoberfest party idea so take a look at the ideas we have for you here. Take a look at what Python Printable Games has for your party ideas. Your other option is to make up your own beer trivia quiz with all the questions and answers you will need...ten, fifteen...twenty? If you have the time and the knowledge...you do have to know alot about beer...to make up your own trivia game, then go for it. Just don't do it with a six pack...you will never finish! Later on you can get into more other beer games. If you want some fun party ideas, beer recipes, beer tasting party games or even some beer gag gifts check out Beer Tasting Party Ideas.